We know it’s still a long way to October, but we couldn’t resist passing along this interesting bit of information that we happened to overhear from someone at Disneyland in nice clothes and an official-looking hat. Apparently, this Halloween Disneyland will be going all out to try and compete with Knotts Scary Farm, Universal Halloween Horror Nights, Legoland Minimassacre, The San Diego Zoo: Poachers Unleashed, and Six Flags Magic Mountain of Noise and Unruly teens. How will they do it? With a special, after-hours, hard ticket event in which Disneyland becomes Disneyland Demised — the realm of zombies! The festivities will begin after sundown, with Main Street filled with fog and populated by undead versions of all your favorite Disney characters. Special merchandise (half-eaten Mickey-ears hats, meat pins, etc.) and treats (such as the turkey leg/churro combination churroleg) will be available. But the biggest treat will be the attractions, almost all of which will have some kind of zombie-related overlay! And after you’re done playing, make sure to stake out a place next to the red-running Rivers of America to enjoy a special presentation of Brainstasmic! Sorry for the sudden lack of posts. We at Chez Disneylies have found ourselves extraordinarily unproductive ever since Disney Interactive released Angry Tikibirds for the iPhone. Seriously — this thing is even more addictive than last year’s Plants vs. Tikis! In terms of customers per square foot, Disneyland’s Candy Palace has been the most popular shop on Main Street since the interactive Intimate Apparel Shop closed in 1956. It often has to stay open up to two hours longer than the rest of the park just to deal with the massive press of customers who can’t even comprehend leaving the park for the day without some handmade peanut brittle, a bar of chocolate, or a giant Lollypop-Guild-style lollypop (even though the Lollypop Guild was in The Wizard of Oz which isn’t even a Disney film). 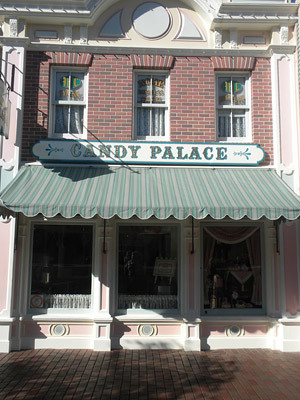 Guests standing beneath the Candy Palace’s awning may notice the subtle scent of peppermint or vanilla. This scent is piped in from gigantic tanks of compressed scent back stage and helps give the Candy Palace’s regular guests their bright aura of joyful, nostalgic addiction. People noticing this scent and wondering where it came from led to guests saying that around the Candy Palace something wonderful was “in the air” — giving birth to the popular phrase. 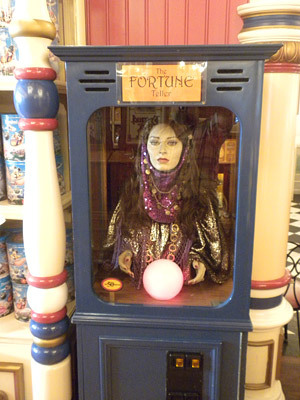 The Penny Arcade’s “Fakemeralda” machine is an electronic embarrassment — an attempt to update the original Esmeralda with electronics and disco lights. The effect is cold, artificial, and lifeless; the fortunes inexact and woodenly constructed. Esmeralda: You are a special individual with hopes and dreams that you keep to yourself but dearly wish to see fulfilled. You have the capacity for great love even though you don’t always show it, and enrich the lives of those who place their trust in you. Today, you will experience clouds in the morning, leading to sunshine in the evening. There is $117.43 in your pocket. Your lucky lottery numbers are 14 12 62 41 6 28. Fakemeralda: I am Eliza. How do you do. Please state your problem. Your fortune? You seem to be quite positive. Is it because you are that you came to me? Wikipedia defines “you” as a female, quadrupedal, ruminant mammal typically kept as livestock. The third digit of pi is 12. Instead, the title of each of these parody shorts will be a "mashup" of a classic Disney film and a famous book title. For example, "Tangled" might be combined with Ray Bradbury’s "Something Wicked This Way Comes," giving us "Something Tangled This Way Comes." Did we miss any? If you’ve heard of any additional titles in this series (or if you hear that we got one wrong), be sure to immediately let us know in the comments! And if we got it completely wrong again this time — we give up! 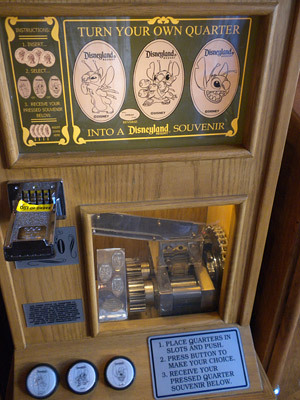 Throughout Disneyland can be found “press a penny” machines that extrude U.S. currency into jolly Disneyland souvenirs in defiance of common sense, the laws of physics, and several Treasury Department statutes. The original Pressed Penny machines require the insertion of a penny to be mangled along with a pair of quarters to pay for the service. The penny is returned with a design of the guest’s choice imprinted on Lincoln’s monstrously elongated face. 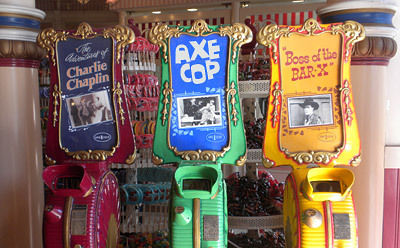 The popularity of these novelty devices led to “press a quarter” machines (pictured here) that require the insertion of a quarter to be entertainingly devalued along with a pair of fifty-cent pieces to pay for the service. In 2001, Disneyland tested “press a Sacagawea” machines in which a dollar coin and two two-dollar bills were inserted, but these proved unpopular, as did “press a dollar” machines in which paper dollars were pressed to little visible effect. In many places in the United States, pennies are considered good luck. Because of this, the original Disneyland devices came to be known as “press your luck” machines, giving birth to the popular phrase. Interesting note: If you ask really nicely and/or have a hissy fit, pressed coins are acceptable as legal tender anywhere on Disneyland property. Sorry to report that we made yet another little mistake yesterday when we re-revised our announcement that Disney had announced a series of all-new short cartoons. We said that the titles of the shorts would be Disney feature film titles mashed up with famous stage productions, and this is not the case. In fact, it’s such a silly idea that we deserve to be brought up on charges for not having questioned it in the first place. Instead, the title of each of these parody shorts will be a "mashup" of a classic Disney film and a famous non-Disney film. For example, "Tangled" might be combined with Troma’s "The Toxic Avenger," giving us "The Tangled Avenger." What Ever Happened to Babes in Toyland? Did we miss any? If you’ve heard of any additional titles in this series (or if you hear that we got one wrong), be sure to immediately let us know in the comments! Despite their cool-sounding name, mutoscopes don’t actually mutate anything, much to the disappointment of Calvin, Hobbes, and related small children. In fact, the only thing at Disneyland capable of causing mutations were the old x-ray machines you could put your head in to see how well your Mickey Mouse hat fit, and Tomorrowland’s iconic “glow churros,” both of which have been discontinued. When activated by the insertion of a penny and the turn of a crank, mutoscopes flip through a series of photographs giving the illusion of a moving picture, much like big, iron, black-and-white flip books, but with a much higher construction cost and less resistance to rust. Disneyland’s mutoscopes feature films by Charlie Chaplin, Harold Lloyd, Hopalong Cassidy, Ronald Regan, and other silent-era stars that mean as much to today’s youth as 78s, dime novels, and, well, mutoscopes. 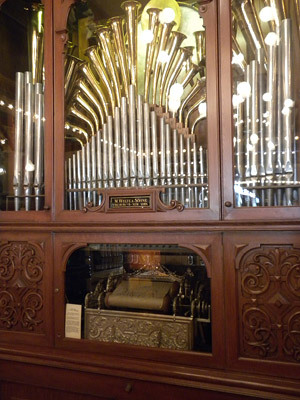 In Disneyland’s early days, some guests complained that they spent a penny only to see a “lame little film” when they turned the crank. This is where the phrase “a turn for the worse” came from. Sorry to report that we made another little mistake yesterday when we revised our announcement that Disney had announced a series of all-new short cartoons. We said that the titles of the shorts would be Disney feature film titles with one letter changed, and this is not the case. In fact, it’s such a silly idea that we deserve to be slapped silly for not having questioned it in the first place. Instead, the title of each of these parody shorts will be a "mashup" of a classic Disney film and a famous musical, play, or other stage production. For example, "Tangled" might be combined with Shakespeare’s "All’s Well That Ends Well," giving us "All’s Well that Ends Tangled." Bring in ‘da Monsters, Bring in ‘da Inc.
That Darn Cat on a Hot Tin Roof! Who’s Afraid of the Mighty Ducks?